Property 3: Memorial Day, 4th of July and Labor Day weekends are all 3 night bookings. Property 15: Completely Renovated Vacation Home On Beautiful Dewey Lake!! Property 19: Lakefront Benton Harbor Home w/Dock & Huge Yard! Property 26: Only 100 miles from Chicago, cute Dewey Lake House is on a double lakefront lot. Property 27: Stillwater Cottage - Gorgeous Retreat On Peaceful, Private Cable Lake! Perfect Family Lake House on ALL SPORT Round Lake! Property 28: Perfect Family Lake House on ALL SPORT Round Lake! Relax and enjoy the sunsets on Magician Lake! Property 31: Relax and enjoy the sunsets on Magician Lake! Look!- New Sprawling Dream Retreat on Magician Lake - Look! Property 35: Look!- New Sprawling Dream Retreat on Magician Lake - Look! Great Rental for a Michigan get away!! Property 37: Great Rental for a Michigan get away!! Luxury beach home on 100 feet of waterfront available for spring families. Property 38: Luxury beach home on 100 feet of waterfront available for spring families. You're going to love sipping your coffee while enjoying Paw Paw lake views. Property 44: You're going to love sipping your coffee while enjoying Paw Paw lake views. Great Cozy Cottage Overlooking Big Paw Paw Lake Just Steps From A small Beach! Property 45: Great Cozy Cottage Overlooking Big Paw Paw Lake Just Steps From A small Beach! The Lily Pad @ Paw Paw Lake; remodeled; great for multiple families! 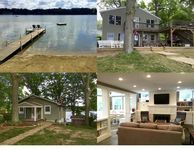 Property 47: The Lily Pad @ Paw Paw Lake; remodeled; great for multiple families! The house is exactly as pictured- spacious, clean and plenty of beds for comfortable sleeping! Our family is already planning a summer vacation to be able to enjoy the outside areas and lake! This was the perfect weekend getaway. The house was immaculate, cozy and tastefully decorated. I wanted to have a quiet weekend to write and reflect and this was the ideal spot for it. The views of the lake are stunning! I will be back soon.